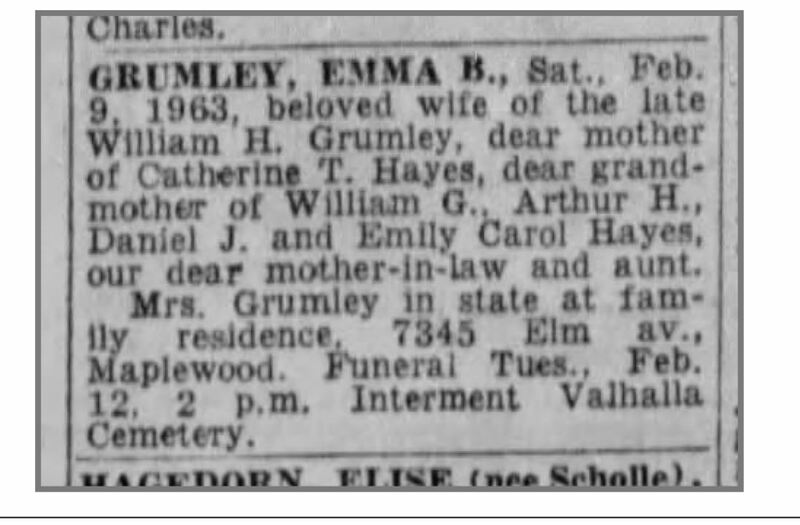 Last post we learned from a newspaper clipping that Emma B. Thomas had married William H. Grumley on the lawn (“one of the prettiest in Ellendale”) in front of the family home, Ellendale Home Place. 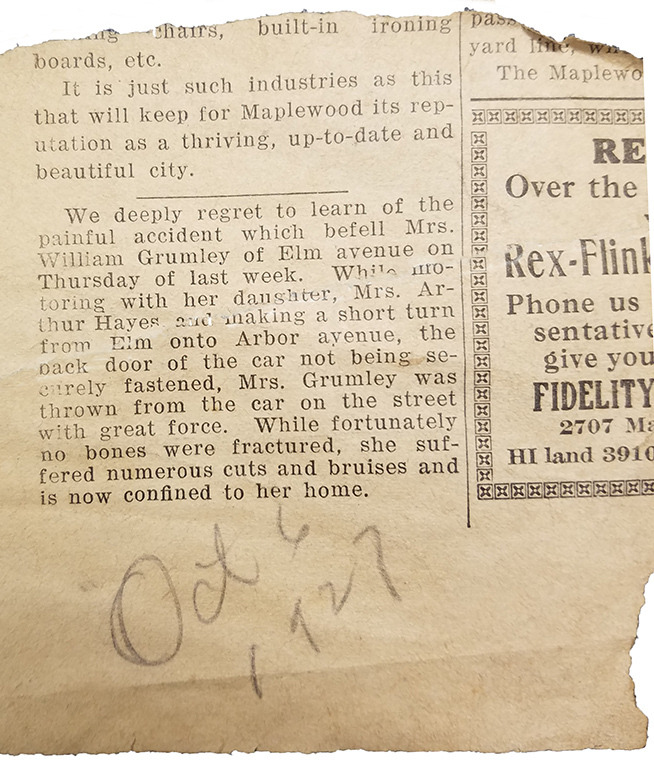 The article goes on to say that “The old mansion covered with the moss and vines of many years growth can be seen from Manchester avenue.” That ceremony was on June 28, 1899. The “old” mansion was eighteen years old. 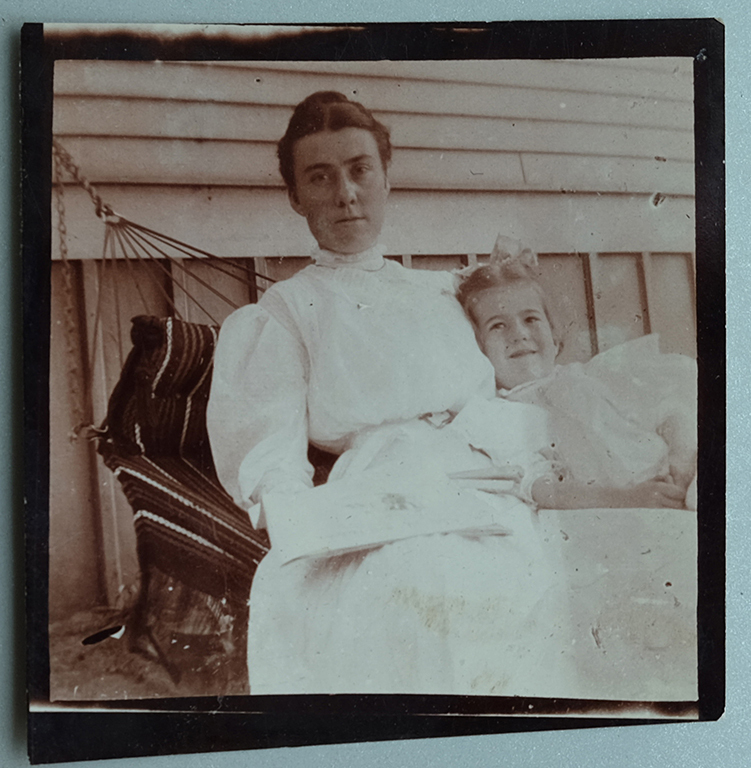 We begin this post with a birth announcement that her father, William Lyman Thomas had written in his 1901 scrapbook on August 18, 1901. The new baby is named after Emma’s deceased sister and called by the same nickname, Kittie, right from the beginning. Kittie had passed five years earlier from typhoid fever. 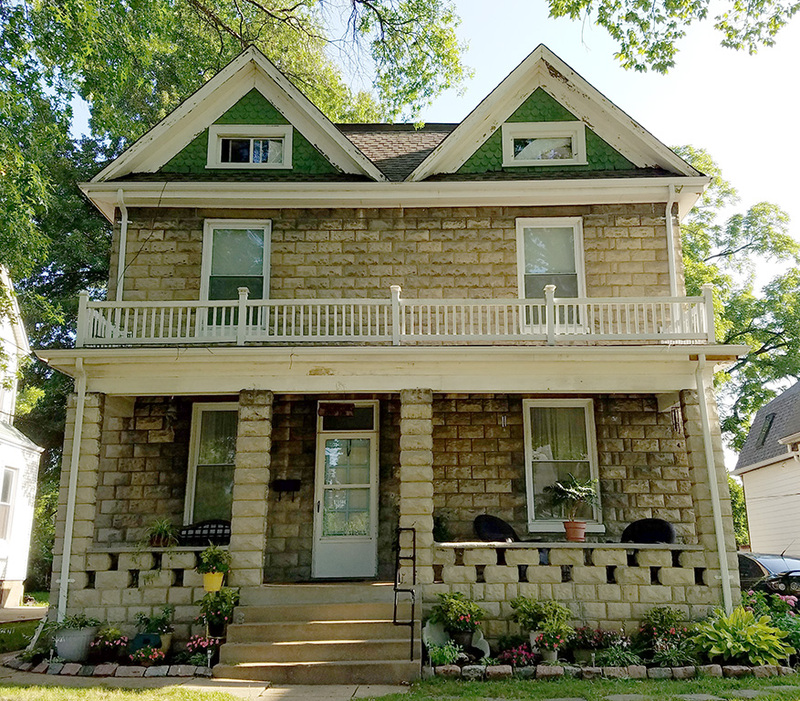 “Two and one half story ashlar, rough faced with front twin pedimented gable roof, asphalt shingled. Porch extends across the front with stone wall with open checkerboard design. Single, brick chimney, right roof slope. Foundation is poured concrete. Windows are double hung. Three window projecting bay on the right side with a pedimented cross gable. Rosemary’s text has a few errors. First, I am fairly certain that the home is not “ashlar” (hewn or squared stone) but rather concrete blocks made to resemble ashlar. 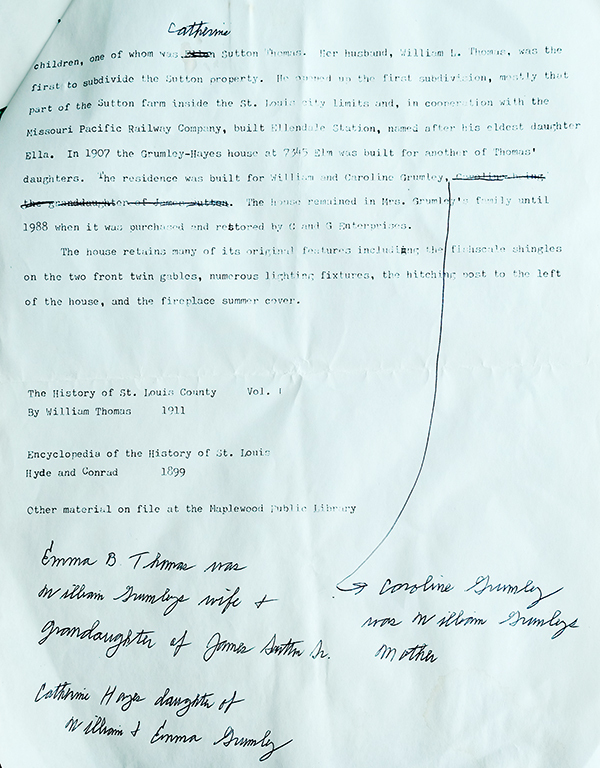 Second, the “Caroline Thomas Grumley” mentioned is William’s mother. The “Thomas” in her name is not correct. Third, as we all know, William L. Thomas did not marry Ellen but instead married Catherine “Kate” Compton Sutton Thomas, the one and only time he married. If anyone is still reading, it is while I was examining Ms. Davison’s very interesting Survey that I made a surprising discovery. Read on. 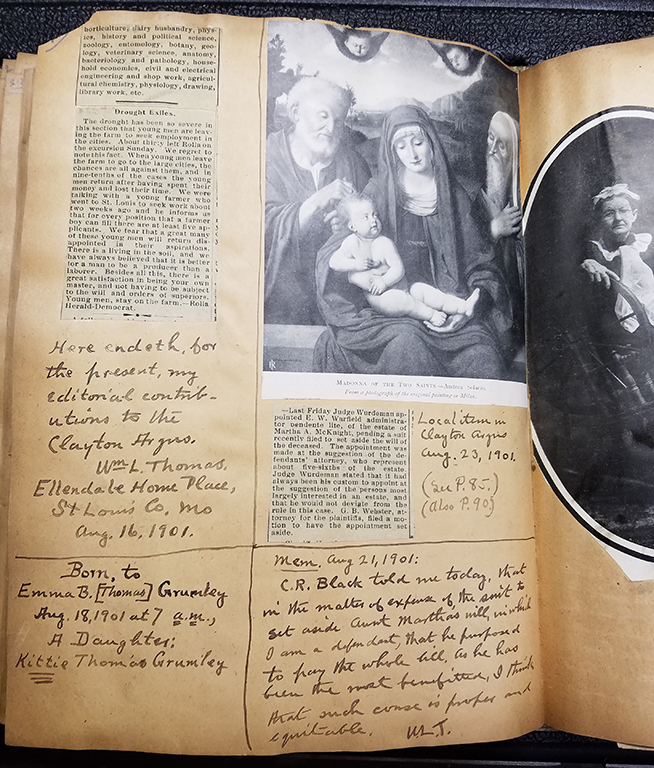 The page from William Lyman Thomas’ 1901 scrapbook recording the birth of his granddaughter. Apparently nicknamed “Kittie” from the beginning, her recorded name was Catherine. If I could find where I read that I’d prove it but you’ll just have to wait. 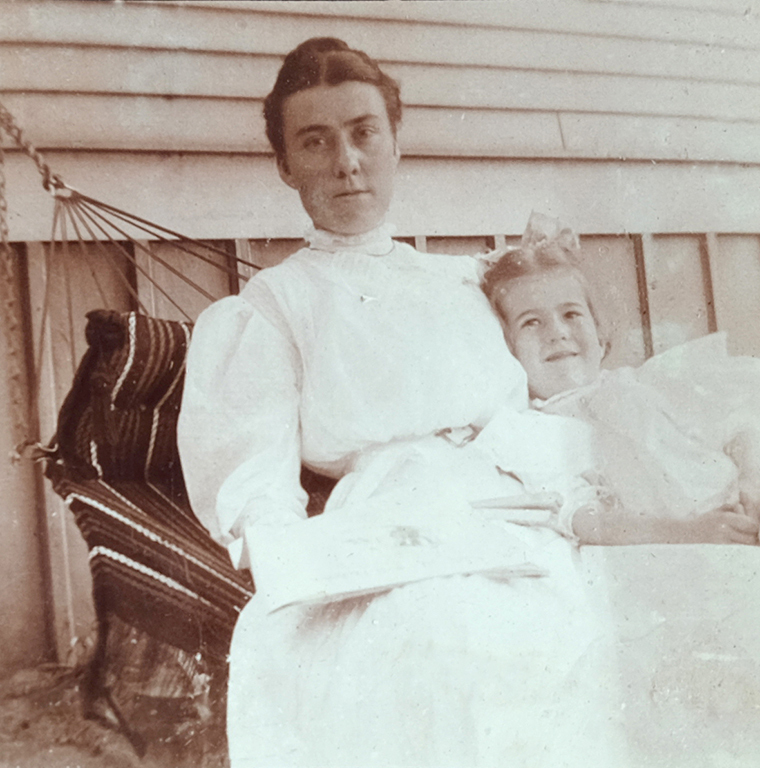 This image shows Emma and her daughter, Kittie, on Aug. 12, 1906, 6 days before the child’s 5th birthday. You’ve seen this image in a previous post but you’ve not seen this original version of it. This is what some images look like when I first copy them. The same image with a little treatment from Photoshop. The Grumley home at 7345. Elm. 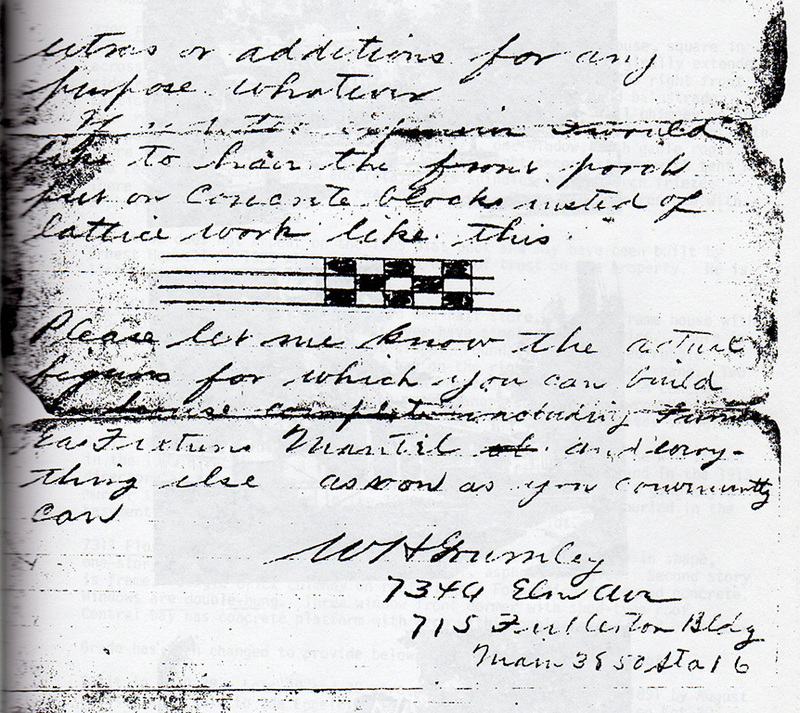 Reading Rosemary Davison’s Survey I discovered that it contained the following letter from W.H. 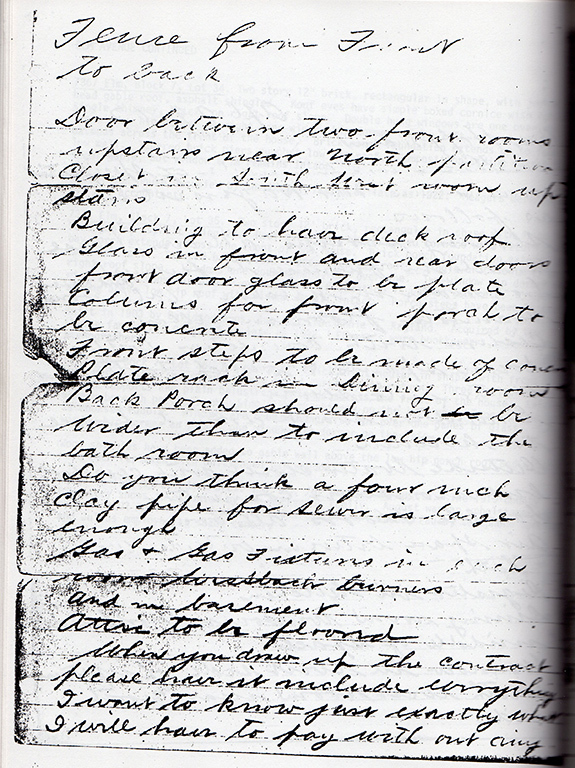 Grumley to Mr. Hoffmann, the builder of the home. Purely a discovery by chance, I almost overlooked it. 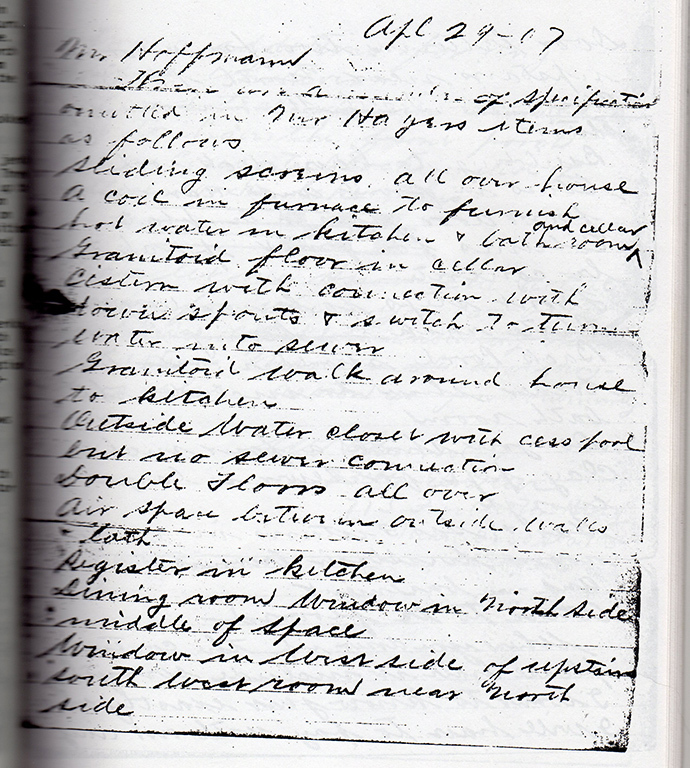 It is about a page away from Ms. Davison’s entry on this property. I glanced and happened to notice the signature while I was thumbing through the pages. This framed document survives in the family. I haven’t seen it other than in this image. See following closeup. It seems to be about volunteer firemen. 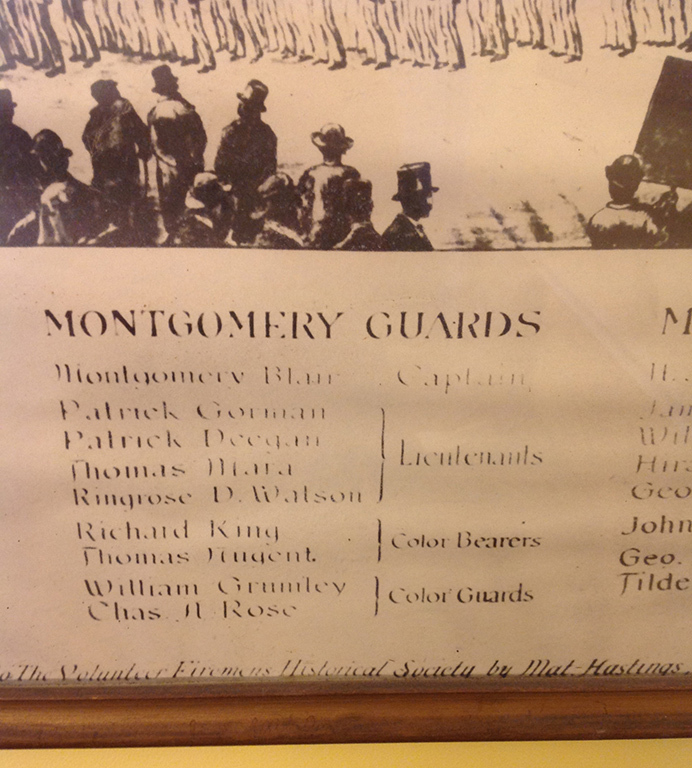 There is a William Grumley listed. Our William’s father? 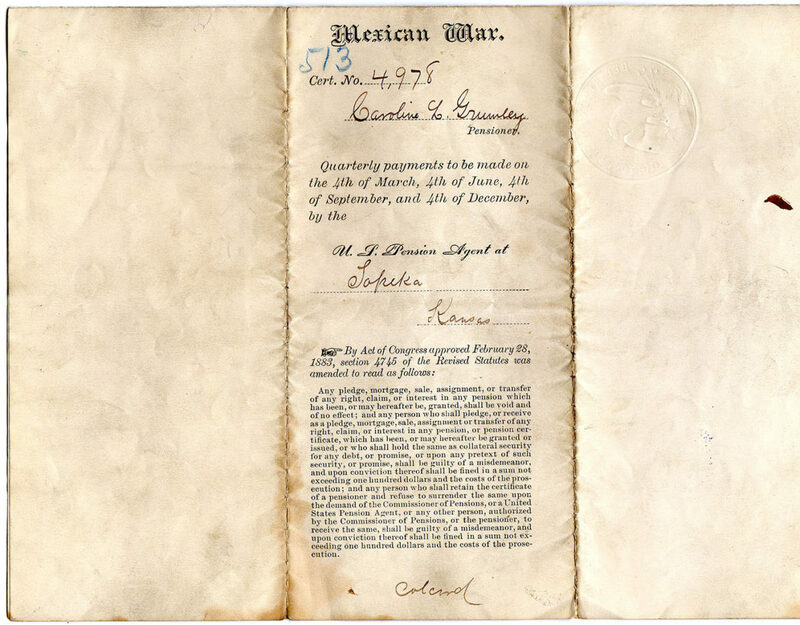 This document from the Mexican War shows that Caroline Grumley’s middle name begins with the letter L.
Does this mean William’s father died in the Mexican War? That was 1848. Those numbers don’t work, do they? Emma was born about 1874. 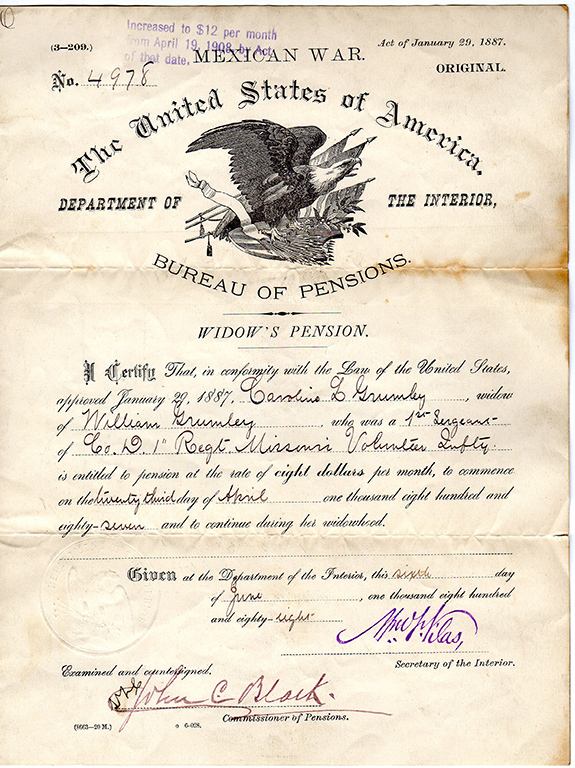 This original document is dated 1888 with a 1908 stamp at the top. Can anyone make sense of this? Reader Dave, where are you? I’ll wrap this up with some odds and ends. This article was published in December 1925. It’s definitely odd what might survive of our lives. Nothing lasts forever. William lasted until 1934. Neither of these obits lists their age at death. I’m not even sure if modern ones do. Emma lived 29 years longer than William. That certainly indicates that he could have been a good bit older than her. And here by the way is the evidence that her daughter Kittie’s true name was Catherine. 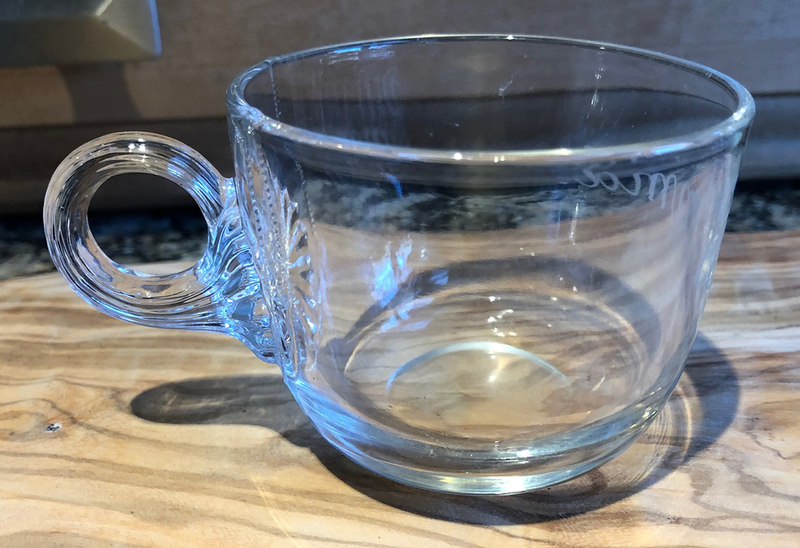 An antique cup that the family preserves. Again a special thanks to the descendants of the Sutton, Thomas, Hayes and McConnell families for sharing these most treasured artifacts with us. are there any makers mark on that cup. The handle and decoration are very pretty. If it was mine I would have been scared to use the thing except on very special occasions. 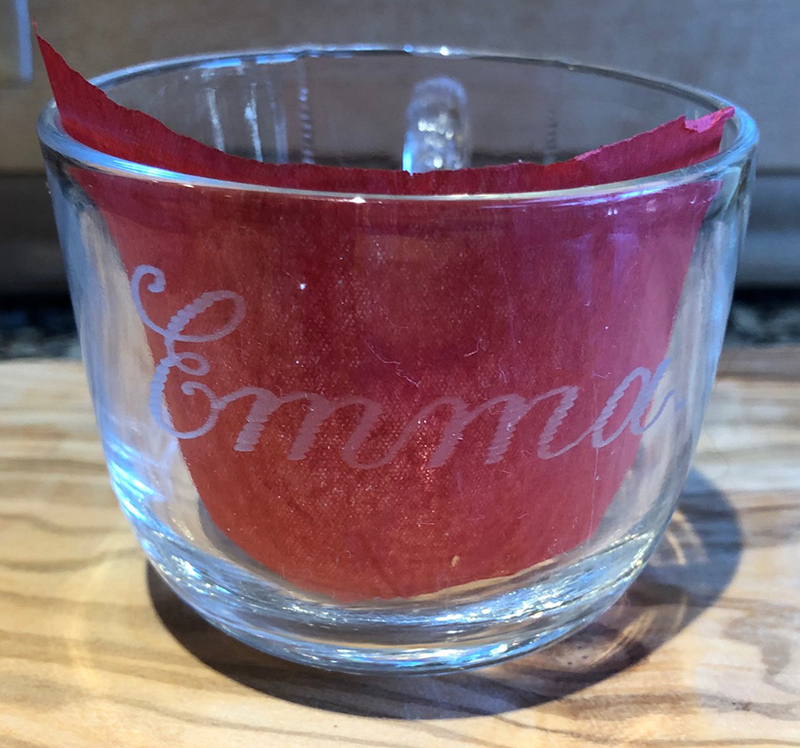 The fact that it is etched with a name makes me wonder if it is the only one or if each family member might have had a cup with their name on it. Or maybe a saucer to go along with it that was equally decorated. Several thoughts: In the 1934, the daughter is identified by the name of her husband, but in the 1963 on by her own name. I believe that is about the time that the custom of referring to married women only by their husband’s name started to die out. The county directories at the Missouri Historical Society’s Library and Research Center at 225 South Skinker start to list residences by city, street, and number in 1922. That will show you who was living in your house, but not necessarily the owner. Montgomery Blair, the captain of the Montgomery Guards in 1843 later became Lincoln’s Postmaster General and built Blair House, now the guest house for the White House. He lived in DC but owned the land fronting Lafayette Park where Benton Place was built. 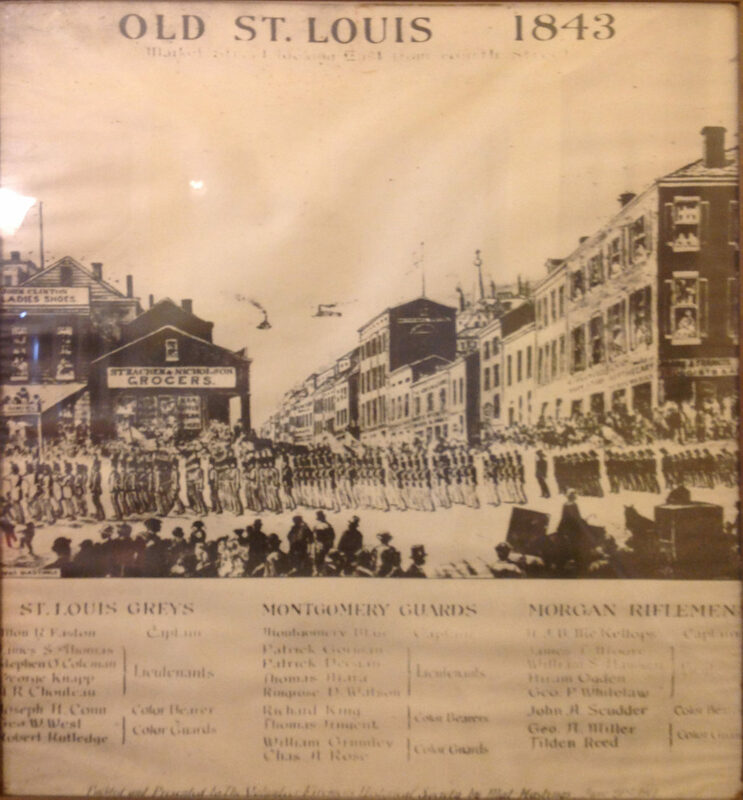 Ringrose Watson, one of Blair’s color bearers, was a prominent early St. Louis businessman. He laid out one the earliest residential subdivisions, Watson’s Fruit Hill Subdivision, on the site of his country home, just west of the present city line in the south part of Wellston. Esley, I think you should be looking over my shoulder while I’m assembling these things. Thanks again for the extra insight. I wonder what the history of the house I grew up in from 44-62 would tell. 7454 Flora. I think it was from the early 1900s. Hey Don, start with the 1940 US Census. It is the most recently available census and the only one that fits your timeline. https://1940census.archives.gov/. Once you have the name of the resident you can start doing Newspaper and Google search to find more info. If there were children living in the home during the 1940 census they may still be alive and in the area. Sadly, time is running out on pre-war citizens. So, if you are interested in it, you might want to start digging into it. My Grandmother, Ida Schimdt, lived in it and when she died in 44 my Mom inherited the house. We had it remodeled by Otto Seiker (sp?) and moved in. I have to wonder if my Great Grandmother owned it or lived in it too. I’ll look at the 1940 Census. There are some old homes on that block. A lady who lived 3 doors east may have been there since the houses were built. Virginia Love. Don, Luke and Esley offer you some very good advice for finding information about your childhood home. I have very little information about single residences. Rosemary Davison’s 1982 survey that I am forever crediting was part of an effort to create an historic district from the original Maplewood subdivision. She did the research necessary and has information on every building. Her boundaries were Manchester, Marshall, Elm and Sutton. Unfortunately your early home in the 7400 block of Flora doesn’t fall within those boundaries. Rosemary’s survey can be found at the Maplewood Public Library. Misunderstanding among the residents led to fear of the district and the effort was abandoned. Pensions for widows were granted, starting in 1887 but they were increased in 1908 from $8 to $12. Further increased from 12 to 20 at an indeterminate date. Applications were accepted until 1926. Looks like she applied between 1908 and 1926. You might be able to get an idea from the application number. I wasn’t able to find any info on whether or not veteran’s widows could apply, but that seems like an answer that could be found online. Hope this helps. It does help, Tony. Thank you very much for your comment.